…you’d never know she didn’t have eyes. Hazel is Lola’s newest buddy, and one of my favourite pug photo subjects. The camera LOVES this girl even more than she loves the camera. For more on Hazel, click here. Love that smile! She is beautiful…and I it’s awesome that she knows it! She sure is a cutie!!! What a smile! And, she really knows how to work it!! Read her sad beginning but happy ending. Hazel can teach us all to refuse to let something limit us. She just radiates happy in that photo. What a smile! Hazel looks like a champ! So cute! 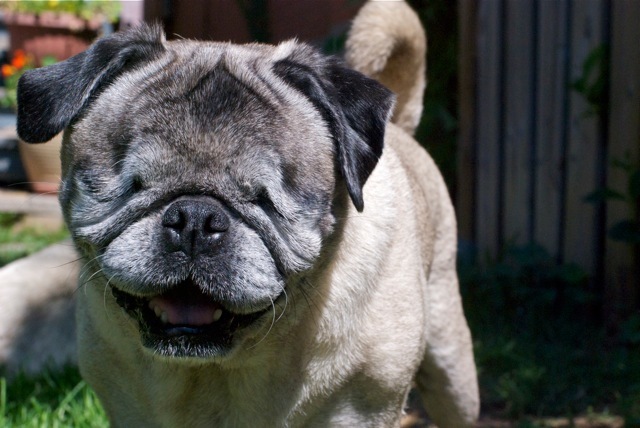 We could all learn about adapting from animals who have “disabilities”. She sometimes makes me want to bang my head against the wall with her antics, but you got to love a girl with that much zest for life and fun and frolic.